When I was asked to give a talk on the topic of Therapeutic Support for this year’s Asylum conference in June, I was immediately, and quite obviously, drawn to considering my role as a psychotherapist when compiling my notes. In particular, I thought about considering the specific benefits of my approach to therapy, focusing on client life issues and the co-creation of certain holistic solutions. Invariably, though, as always seems to happen when asking my intuition for guidance, another more interesting answer came to me in respect to giving this talk. During these globally trying times, maybe we need to look for support in another way? 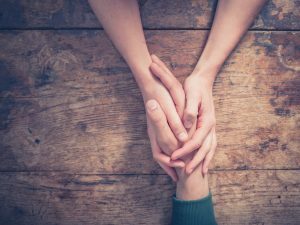 If we’re not able to access external mental health resources directly, for whatever reason, perhaps the answer lies in each of us securing a very different type of support? One that works for us individually, in a more bespoke kind of way? After all, we are all very different, with very different needs. Despite these different needs, however, we are, all of us, I’m afraid, set up to be emotionally dysfunctional. Guided by our role models – this includes what we learn from our parents and society in general – we are taught to repress and distort our own emotional process. We are trained from a very early age to be emotionally dishonest. My younger brother was diagnosed with paranoid schizophrenia back in 1990, and I know, from personal experience, the lengths to which my own family members have gone, in an attempt to keep themselves safe, emotionally, and how this has manifested in various forms of illness. So much so, that 25+ years later, there is a metal plaque in the family home, taking pride of place in recognition of this, saying: This family knows how to put the fun in dysfunctional! Most families are indeed just that – quite dysfunctional – our job is to simply make the most of it! Now this isn’t about discounting the need for therapy – how could it be when it now represents my entire working life’s purpose? No, what I’m talking about is finding a way for people to learn how to take greater personal responsibility for their own healing, by re-empowering ourselves so that we’re not at the mercy of our doctors or the drug companies! I am totally convinced that nearly all our life problems today stem from unmet needs during childhood – be it experiencing harrowing health, money misery or rotten relationships, they will all have their roots based and firmly entwined with the messages, or so-called injunctions, that were fed to us by our caretakers. Modern civilisations – both eastern and western – are only one or two generations away from believing that children were property, which goes hand-in-hand with the other ridiculous notion that women are also property! I distinctly remember in my early years, while training to be an accountant, coming across the words, ‘wife’ and ‘chattel’ in the same sentence when it came to the administration of tax law and the legal aspects of drafting up a will!??! I still can’t believe I even saw that!??! The idea that children have rights, when it comes to individuality and dignity, is relatively new in modern society. The predominant and underlying belief, as it has manifested in the treatment of children, has been that children are an extension of, and the tools to be used by, their parents. Is it any wonder then that children swallow whole whatever is fed to them while growing up? Alice Miller’s book, ‘The Drama of the Gifted Child’ displays a very telling insight into the basic beliefs that underlie some attitudes, when she talks of people, “stamping out a child’s exuberance”. In other words, you have to crush the child’s spirit in order to control them! Other idiom-like statements, such as “children should be seen and not heard” and “spare the rod and spoil the child”, also do very little to help matters. It is only in recent history that our society has even recognised child abuse as a crime instead of it being the inherent right of a parent!?! The concept of heathy parenting as a skill to be learned (and not just something that happens automatically simply because you’ve given birth! ), is still very new in our society. Any society that does not respect and honour individual human dignity is one that does not meet the essential needs of its members. Patriarchal systems that demean and degrade women and children are totally dysfunctional in their very essence. The way we form core relationships with our own self, with life, and with other people, is based on the messages we take on board during our early years. Reactions we receive during childhood will either help or hinder our adult years. We have no training or initiation ceremonies, no fully approved programmes to help us let go of our old internal programming so that we can learn how to BE, to have a healthy relationship with ourselves before being able to have a fulfilling one with another. We build upon the foundation of the dysfunctional past and so experience the same in the future, and so the cultural hot potato is formed, passed on from one oblivious generation to the next, forever more, until and unless someone is brave enough in their attempt to break the cycle. If we don’t look to change then, as adults, we simply react to the programming of our childhood. To say that our childhood emotional wounds do not affect our adult lives, both personally and professionally, is ridiculous. To think that our early programming has no bearing on the support we’re in search of today is denial to an extreme. Responding to the needs of our Inner Child lies at the very heart of therapeutic healing and support. When we react out of fear, insecurity and dysfunctional belief systems, it brings about all manner of distress, emotional heartache and mental upheaval. Just look at some of our world leaders today for the perfect example of Inner Child needs being ignored, now being left to go on the rampage!! It is only through each of us taking responsibility for the care of our individual Inner Child, that we can learn to heal ourselves of any pain we feel we today, be it physical, mental or emotional. Learning to respect the little kid that lives inside each of us, to discover its desires and to love it unconditionally, so that the early wounds can be kissed better, must be seen as fundamental at both an individual and global level. So, depending on how you wish to define Therapeutic Support, maybe in the absence of anything else being available ‘out there’, this internal resource is really all we do have when it comes to our own healing?? No time like the present – let’s get started! So……. who has the first question?